Now that fall is nipping at our feet, groups and individuals are starting to think about fun events they can do in the cozy warmth of the great indoors. If you’re looking for entertainment, then we can help you. For anyone who likes card games, a fall poker tournament is just the right event for you to plan. People host these parties for a variety of reasons including week night get-togethers, company functions and charity fundraising events. They are wildly thrilling and popular parties for groups of all sizes. Whatever the reason for planning a card tournament, we can help you make it an exciting and successful event. Poker is a thrilling card game with a rich history that dates back to the 19th century. What started off as a recreational pastime has grown into one of the most popular games in the world. Poker is played by millions of people worldwide every day in homes, casinos, gaming halls and online. As it’s popularity has grown, so have the many variations of the game. 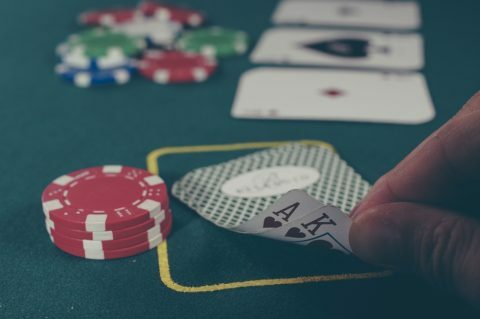 There are now several different poker games and tables to choose from including Texas Hold ‘Em, 3 Card Poker, Pai Gow, Caribbean Stud, Let It Ride and the standard Poker. To get an estimate for your poker party rentals, call us at (317) 857-0168. At Casino Party Experts, we have the different poker tables for your gala. You can rent one or all of the tables for your function. Our tables are professional, high-quality poker stations. They are the same tables used in professional casinos. If you’re not sure which table to choose for your function, we can help you by going through the different variations of this outstanding game. Along with our elite poker tables, we also have all of the accessories and decorations that you will need for your spectacular poker event. At Casino Party Experts, we will make sure you have everything you need for a splendid tournament. If you or your guests have never played poker before, or don’t know how to play a particular poker game, we can take care of that too. At Casino Party Experts, we hire only the best dealers in the state. Our staff is highly trained, professional poker dealers to run the tables. Our staff know everything about the game and will be happy to instruct your group on the rules and regulations of each game. As we start heading into the fall season, individuals and groups are starting to plan more indoor activities. If you’re looking for something fun and different to do, contact us at Casino Party Experts. We have everything you will need to host a thrilling poker tournament. This popular card game is the perfect event for formal, semi-formal and casual celebrations. Contact us at Casino Party Experts today at (317) 857-0168 for an estimate for your poker party rentals.